Plot Summary: Conor is a thirteen year old boy who is haunted by a monster that walks outside his house in the middle of the night. The monster begins telling him stories with important lessons about loss and life attached to each one. At the same time, Conor is dealing with his mother's illness and her almost certain death. As her health deteriorates, Conor's anger and frustration, as well as his denial, with the situation reaches a breaking point. It is at these times that he and the "monster" appear to be one. Siobhan Dowd, author of young adult novels such as A Swift Pure Cry, wrote this shortly before her death from breast cancer. Patrick Ness, another renowned young adult author, finished the book. Subject Headings: Self-actualization (Psychology) -- Fiction. Similar to A Monster Calls, this book deals with a young boy visited by creatures that promise to save his sick brother. In both of these books, boys deal with monstrous creatures of their own imaginations. Both tales include a supernatural spirit. In this, a teenage boy is aided by the ghost of Jacob Grimm when he is left to support his family. This is a collection of writings from Esther Grace Earl, an aspiring writer who died from thyroid cancer at age 16. The author of this memoir was born with HIV and while she was in school, everyone found out and she was bullied to the point of suicidal thoughts. Both books deal with people being bullied, often for something they cannot control. When Brent Runyon was a teenager, he set his body on fire in a suicide attempt and suffered third degree burns over most of his body. What a fascinating aspect to this novel being written. I had no idea the novel was started by Dowd and completed by Ness. I’m curious if this book has picked up additional steam with the recent release of the film. Not that it needed it as I’ve heard this was a very touching story; but you know how movies have the potential to sometimes revitalize a book; both in sales as well as library circulation. Have you seen the film? Did you prefer the book over it? I’ve heard this same author wrote another series entitled, “Chaos Walking”, which will be adapted to the screen by Charlie Kaufman. I’m not sure if you are a fan or have heard of him (Eternal Sunshine of the Spotless Mind and Adaptation are two of them), however, that is quite an exciting prospect, as least for me personally. Ironically, Kaufman will also be adapting Slaughterhouse-Five and that is a book I’ve been wanting to read for years now. No, I haven't seen the film yet, but I definitely want to. I have heard that there were some changes made, but it stayed fairly close to the book. The movie is actually what made me finally read it; it's been on my to-read list since it came out. I haven't read any other Patrick Ness books, though they have been recommended to me. I'm familiar with Charlie Kaufman's movies, so that sounds really interesting. Oh my gosh! I didn't know they were making Slaughterhouse-Five into a movie! I'm both excited and a little skeptical about how it will be. I read the book years ago and remember it being a bit of a mind trip. Hi Melissa, I selected this book for my library collection, but had no desire to read it until I read your annotation. Now, I can hardly wait to read it, then watch the movie. Thank you! I heard that this was a really good book. I also saw ads for the movie too, and I really wanted to see it too, but I think it I will wait until I read the book. 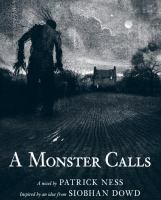 You read-a-likes also sound interesting and very appropriate for the events of A Monster Calls. Having the background information about the author dying before the story was completed adds another layer emotion and connection to the story. That's a good book :) My daughter has it. She asked me to take her to the movies to see the movie version and at the time I didn't know what it was about. I cried and cried. I cried so loud the people in front of us turned around and looked at me. Oh Jodi! I can definitely see you doing that lol. I haven't seen the movie... yet. But I will! And I'll have tissues. THIS BOOK HAS ME AN EMOTIONAL WRECK EVERYTIME I READ IT!!! And I love it. I love a book that makes you feel that emotional, the movie version was amazing as well. Great annotation. Full points!